Not quite 8 years ago, in 2009's That Touch Of Mink Flu, we looked at a story out of Denmark, where at least 11 mink farms in the Holstebro were reported to be infected with a variant of the human H3N2 virus. Also in 2009, an H3N2 Swine Influenza was detected in Canadian Mink, reported in a Journal of Clinical Microbiology study called Characterization of a Canadian Mink H3N2 Influenza A Virus Isolate Genetically Related to Triple Reassortant Swine Influenza Virus. Three years earlier (2006) CIDRAP reported on a European mink found infected with an agressive form of the H5 flu virus in the Blekinge region of southern Sweden near where H5N1 had been detected in wild birds. And in 1984 a large outbreak in Swedish mink farms was found to be due to the H10N4 avian virus. Mink are a member of the Mustelidae family of carnivorous mammals, which also includes otters, badgers, weasel, martens, ferrets, and wolverines. Many of these species are susceptible to flu viruses – most notably ferrets – which are often used in influenza research. While small peridomestic animals like mink, skunks, and rabbits are known to be susceptible to certain types of influenza infection, very little is known about their ability spread these viruses to other speceis, or how host adaptation might influence the evolution of flu viruses. In 2015, we revisited mink flu in That Touch Of Mink Flu (H9N2 Edition), after a study was published in the Virology Journal on a serological survey of antibodies to H9N2 (along with H5 & H7 viruses) in Chinese farmed minks, along with the results of experimental infection of minks with the H9N2 virus. This 2015 study found that mink inoculated with the H9N2 subtype replicated the virus in their lungs (and to a lesser extent) heart, brain, and kidney. While H9N2 infection was non-fatal for mink, they developed lung lesions, edema, and shed the virus through their respiratory tract. While H9N2 is regarded as having only moderate pandemic potential on its own (see CDC IRAT score), it more than makes up for that by its promiscuity - lending its internal genes to a long list of successful and dangerous HPAI & LPAI viruses, including H5N8, H5N6, and H7N9 (see graphic below). You'll find a detailed look at H9N2's evolution in last April's Vet. Microb. 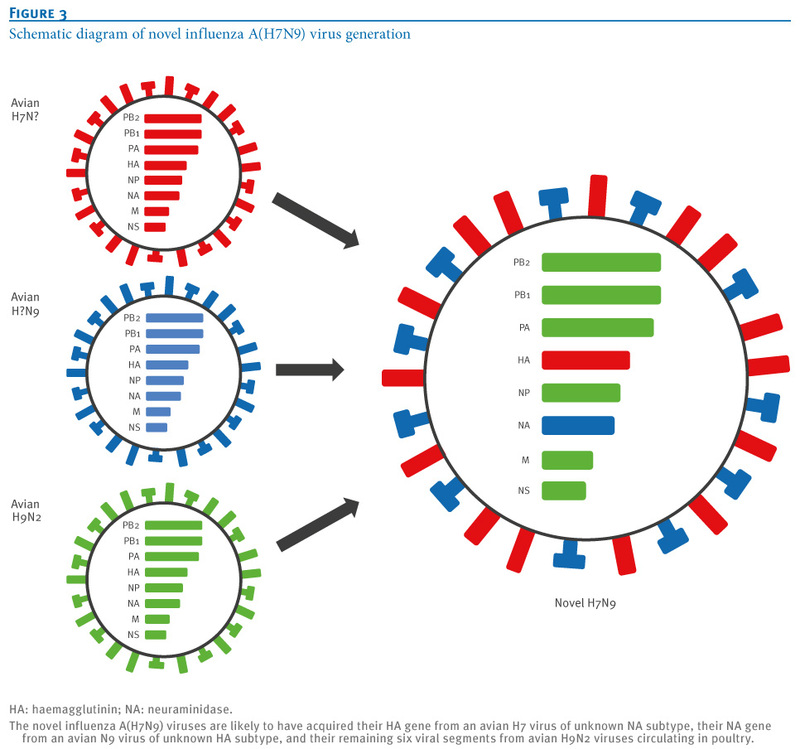 : Analysis Of Korea Lineage Of Avian H9N2 viruses, but evidence shows that H9N2 has been a major driver of novel influenza's evolution in Asia and the Middle East. All of which serves as prelude to a new study, published today in Nature's Scientific Reports, on the seroprevalence and transmissability of H9N2 from minks to other peridomestic animals. H9N2 influenza A virus (IAV) causes low pathogenic respiratory disease and infects a wide range of hosts. In this study, six IAVs were isolated from mink and identified as H9N2 IAV. Sequence analysis revealed that the six isolates continued to evolve, and their PB2 genes shared high nucleotide sequence identity with H7N9 IAV. The six isolates contained an amino acid motif PSRSSR↓GL at the hemagglutinin cleavage site, which is a characteristic of low pathogenic influenza viruses. A serosurvey demonstrated that H9N2 IAV had spread widely in mink and was prevalent in foxes and raccoon dogs. Transmission experiments showed that close contact between H9N2-infected mink and naive mink, foxes and raccoon dogs resulted in spread of the virus to the contact animals. Furthermore, H9N2 challenge experiments in foxes and raccoon dogs showed that H9N2 IAV could infect these hosts. Virological and epidemiological surveillance of H9N2 IAV should be strengthened for the fur animal industry. Avian influenza viruses, like H9N2, bind preferentially to the α2-3 receptor cells that are commonly found in the gastrointestinal tract of birds. When they jump to mammals - like mink, foxes, or raccoon dogs - they have the potential to evolve into a more `mammalian' adapted virus. Mink farming has become big business in China, with more than 60 million raised in 2012. Increasingly fox and raccoon dogs are raised on the same farm, increasing the odds of interspecies transmission of novel viruses. In China, farmed animals are often fed a diet that includes raw poultry or poultry products (cite), which increases their risk of exposure to avian viruses. This practice inadvertently led to the deaths of hundreds of exotic tigers in Thailand in 2004 (see HPAI H5: Catch As Cats Can) from HPAI H5N1. Transmission experiments showed that close contact between H9N2 infected mink and naïve contact mink, foxes and raccoon dogs resulted in spread of the virus to the sentinel animals as determined by virus isolation and/or seroconversion. H9N2-challenged foxes and raccoon dogs also showed H9N2 IAV could infect these animals without clinical signs and virus shedding, but with seroconversion. A serosurvey in foxes and raccoon dogs demonstrated that H9N2 IAV circulated in these hosts. In some areas in China, mink, foxes and raccoon dogs are raised on the same farms, which could increase the chance for H9N2 IAV to cross the species barrier. Our findings suggest that the potential exists for H9N2 IAV transmission to humans exposed to fur animals. Virological and epidemiological surveillance of IAVs in mink, foxes and raccoon dogs should be strengthened for public health. While the novel influenza viruses with the most pandemic potential right now are the H7N9's and HPAI H5's from Asia (see Updating the CDC's IRAT (Influenza Risk Assessment Tool) Rankings) - if we look deep enough - we often find H9N2's fingerprints alongside.